Traditionally, the Netherlands was friendly to Israel and while it has always had its anti-Semites and even, historically, fascists, it had far less proportionately than other European countries during the last half-century. In other words, if things are bad in the Netherlands, they’re really bad. Last year, the chief rabbi of the Netherlands spoke in a published interview in which he spoke extensively about his love for the country, the good treatment of Jews there, and other such points. Asked at the end, however, whether there was any future for Jews in the country he said, “No,” and advised the community to move to Israel. A lot has to with the increase in the number of Muslims there, who are strongly anti-Israel and increasingly antisemitic. But it’s not an accident that antisemitism is often compared to a virus, and in Europe the immunity conferred by the Holocaust appears to be wearing off, and it is spreading in the general population. In a few countries, including some whose Jewish population was almost entirely wiped out, anti-Jewish banners are routinely in evidence at soccer games. In Greece, Golden Dawn party leaders and activists routinely blame Jews for Greece’s economic problems, deny the holocaust, etc. There are only a few thousand Jews left in Greece (from a pre-WW2 population of about 77,000). The 1,500 Jewish residents of Malmo, Sweden (pop. 300,000) are fleeing because of a combination of violent anti-Jewish acts by Muslims and an official attitude that it is the Jews’ fault. In Norway, with a tiny Jewish contingent of about 1,000 people, ‘Jew’ is a popular insult among high school students. New figures put the Jewish population of the world at 13,800,000. 6 million of them are in Israel, 5.5 million in the US, 680,000 in Canada, 500,000 in France, and 290,000 in the UK. Jews in Europe are feeling more and more uncomfortable as a result of increasing antisemitism, from Muslim immigrants, the extreme Left, and of course the old-fashioned fascist Right. In France, it has taken a particularly violent form, and many French Jews feel that the authorities are not capable of protecting them. Although its practitioners are at pains to deny it, the irrational and extreme hatred of Israel evident in many segments of European society has long since become substantially indistinguishable from Jew-hatred. There are similar trends in other places — in South America, where Hugo Chavez exploited anti-Israel and anti-Jewish attitudes in the traditional way, and even to a smaller extent in Australia where there has recently been an influx of Lebanese Muslims. On the one hand, in the US there is a very strong taboo against anything perceived as a form of racism — sometimes to the point of silliness. As I’ve written before, the trauma of institutionalized anti-black racism has created a reaction not dissimilar to the European one that followed the Holocaust (which was felt in the US to a lesser extent). Ethnic jokes and stereotypes are not acceptable in polite society or media here — far less so than in the UK, for example — even though our laws about what can be said in public are more permissive. On the other, extreme anti-Zionism (what one blogger called “misoziony” and Judea Pearl referred to as “Zionophobia“), irrational hatred of the Jewish state, flourishes here on the Left and in academia. It does not trigger the antibodies of the anti-racism taboo, and indeed receives cover as an expression of free speech and academic freedom — the practitioners thereof understand this very well and push it to the limit. The fact that anti-Zionism has become part of the conventional wisdom in universities is bad, because what happens there is what economists call a ‘leading indicator’ — a measure that has predictive value for the future. Today’s students are tomorrow’s business and political leaders, and we can already see the effects of this in the attitude toward Israel found among officials in the left-leaning Obama Administration (including the President himself). Although we cannot predict for certain what will happen in the US, the experience of much of the rest of the world is not encouraging. So even American Jews can be excused if they return to the ‘outdated’ idea that the Jewish state exists in part to be a place of refuge for persecuted Jews. It’s ironic to note that some of the extremists of the Israeli Left might not exist if their parents or grandparents hadn’t found refuge in the ‘Zionist entity’ that they love to revile! We know that “history is written by the victors,” and until recently much of Israel’s history was written by the Left. Begin, Jabotinsky and others were treated as marginal, extremist figures, sometimes even vilified by the socialist establishment. Israel underwent a political revolution in 1977 with the election of its first right-wing government, led by Menachem Begin, although vestiges of the old leftist establishment hung on in the arts, academia and media. Maybe for that reason the historical record is still unfair to Begin — whom some believe to have been the greatest of Israel’s Prime Ministers — and to Vladimir (Ze’ev) Jabotinsky, a remarkably prescient thinker and philosopher of Zionism. Jabotinsky thought that Israel is not only physically located in the Middle East, but must live in the Middle East in order to survive. He understood the importance of ideology, of holding on to one’s convictions, of symbols and of honor — quite the opposite of some of today’s ‘pragmatic’ politicians. In 1911, Jabotinsky wrote an essay called “Instead of Excessive Apology” (thanks to Dan Friedman for reminding me). One hundred and two years ago, he explained why it is craven and in any case pointless to apologize to Jew-haters the way PM Netanyahu did to Turkish Prime Minister Erdoğan. 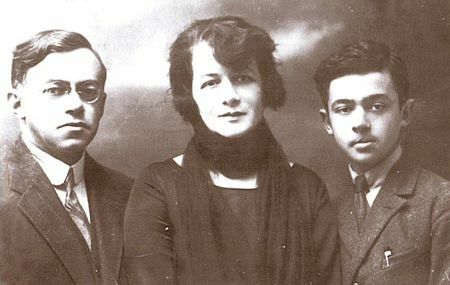 In searching for a translation of Jabotinsky’s piece, I found one by Boris Shusteff, an Israeli of Russian origin. Shusteff had a few words about apologies also, even when there is something to apologize for (which of course there was not in the case of Turkey). Here is Shusteff’s translation of the main points of Jabotinsky’s essay. Of course the ‘we’ refers to the then-stateless Jewish people, but it applies equally to the Jewish state. It could have been written yesterday, couldn’t it? We constantly and very loudly apologize… Instead of turning our backs to the accusers, as there is nothing to apologize for, and nobody to apologize to, we swear again and again that it is not our fault… Isn’t it long overdue to respond to all these and all future accusations, reproaches, suspicions, slanders and denunciations by simply folding our arms and loudly, clearly, coldly and calmly answer with the only argument that is understandable and accessible to this public: ‘Go to Hell!’? We do not have to account to anybody, we are not to sit for anybody’s examination and nobody is old enough to call on us to answer. We came before them and will leave after them. We are what we are, we are good for ourselves, we will not change and we do not want to. Obama did not suggest that recognition of Israel as a Jewish state be a precondition for negotiations with the Palestinian Authority (PA), and PM Netanyahu has called for “negotiations without preconditions.” But there is no doubt that it must be a precondition — not just for talking to the PA, but for diplomacy with anybody about anything. How can a nation have a give and take discussion with someone who thinks that it is fundamentally illegitimate? The Arab League initiative, for example, which I discussed here, does not include any mention of recognition. This is not merely an oversight: the initiative was conceived and is understood as an admission by the “Zionist regime” that is fully responsible for the conflict. The initiative calls for a redress of their historic grievance in part by means of the ‘return’ of almost 5 million Arabs who claim hereditary refugee status — something unheard of in the annals of diplomacy — which is incompatible with a Jewish state of Israel. An agreement acceptable to the PA or the Arab nations must include an admission of guilt and an acceptance of the ‘ownership’ of the land by Arabs. Once this is done, then they may be more or less magnanimous to the Jewish residents — Hamas talks about killing them and the Arab league is willing to have ‘normal relations’ with them — but true Jewish sovereignty is out of the question. So the Arabs insist on ‘right of return’ in order to reverse the nakba. They insist on withdrawal from 1967 territories to reverse the results of the several wars, and they insist on the release of all terrorist prisoners, even convicted murderers. All this sounds entirely fair and reasonable to them within the framework of their narrative. This is why discussions about borders and security entirely miss the point, it is why the Camp David, Taba and Olmert proposals went nowhere, and why the negotiations that President Obama intends to restart will fail as well. Unfortunately, many Israelis are blind to the importance of Arab ideology. They see the harsh statements of Arab leaders as ‘merely symbolic’, made for propaganda purposes or for home consumption. They believe that the Arabs are at bottom pragmatists like themselves, willing to set aside ideology for economic development or some degree of political autonomy. This explains some really terrible ideas, such as the plan which surfaces periodically to grant the ‘refugees’ a ‘right of return’ in principle, but not in fact. Proponents say that it would satisfy the Arabs’ need for symbolism without destroying the Jewish state. But if such an abstract right were granted, then it would immediately be followed by demands to implement it in reality — just as the ‘apology’ to Erdoğan has been followed by demands to end restrictions on the flow of weapons and explosives to Hamas in Gaza. They are not posturing. They mean what they say, and what they say is that they don’t accept a Jewish state. As long as the Arabs cling to the idea that Jewish sovereignty is unacceptable, then no possible negotiations can end the conflict. But the process of negotiating under pressure from the US — and the pressure is always almost all on Israel — is not only frustrating and pointless, it can be humiliating and even dangerous. There is a simple solution. Israel must insist that there can be no negotiations until all parties agree that Israel is the Jewish state of the Jewish people. Reactions to the surprise ‘apology’ from Israel to Turkey for the Mavi Marmara incident are coming in, and they are interesting. Barry Rubin points out that the actual statement by Israel does not accept blame for the deaths of nine ‘activists’, but merely refers to “operational mistakes,” apologizes for “any error which may have led to the loss of life,” and offers compensation. All true, but who cares? It is being reported as an admission of guilt by Israel, an affirmation of the anti-Israel narrative of the incident, in which Israel deliberately killed “peace activists” when it “committed war crimes” by “attacking” the ship. One correspondent writes to me that he does not trust Erdoğan, but “this is a strategic decision, and if this can help Israel, I accept. At least this is the position of the israeli army commanders. Everybody today recognizes that the Marmara issue was very badly handled.” In other words, if this will improve relations between Israel and Turkey (and Obama?) then it’s worth a little embarrassment. I don’t buy it. First, it will not improve relations with Turkey (indeed, see the end of this post!) because relations are poor as a result of a deliberate strategy, not an unpleasant incident. Relations have deteriorated consistently since Erdoğan’s AKP came to power in 2003. Erdoğan hosted Hamas leaders in Ankara, and humiliated Israeli President Shimon Peres on the stage at the World Economic Forum in Davos, Switzerland in 2009. And of course, remember that Erdoğan’s regime orchestrated the Mavi Marmara incident as a deliberate provocation — and Israel fell right into the trap. Second, it is not merely ‘a little embarrassment’. It squanders the diplomatic gains Israel achieved when the UN’s own Palmer Commission found that Israel’s blockade of Gaza and its boarding of the ships of the flotilla were legal and justified (although it did criticize Israel’s ‘excessive’ use of force). It constitutes a loss of honor in the honor-obsessed Middle East (did any Arab leader ever apologize for anything?) And it is an invitation for further blockade-breaking flotillas. This is in addition to playing into the growing meme that Jews or Israel may not defend themselves, while supporters of ‘Palestine’ are permitted any atrocity in the name of the oppressed. Technically, the ‘apology’ does none of these things. ‘Technically’ and about $3 will get you a cup of coffee at Starbucks in Fresno. Despite the formal apology issued by Netanyahu on Friday in the presence of US President Barack Obama, Erdoğan’s Saturday statement indicated that Ankara was not entirely prepared to let bygones be bygones. He stressed that during his conversation with him, Prime Minister Benjamin Netanyahu had promised to improve the humanitarian conditions in the Palestinian territories. “I accepted the apology in the name of the Turkish people,” Erdoğan was quoted as saying, adding that he was planning to visit Gaza in April. Will Israel get anything out of this deal? I doubt it. And what’s been lost is lost. Same story, over and over. Israeli Prime Minister Benjamin Netanyahu apologized to Turkey for the 2009 [sic] raid on the Mavi Marmara flotilla that killed 9 Turks and one Turkish-American citizen [sic], US officials said Friday, in what they hailed as “a first step” toward reconciliation between the former allies. The apology was made in a thirty minute, three-way call between President Obama, Netanyahu and Turkish Prime Minister Recep Tayyip Erdoğan, conducted from a trailer on the airport tarmac in the last hour of Obama’s historic visit to Israel, the US officials said. “Netanyahu apologized for the Mavi Mara flotilla incident and acknowledged ‘operational mistakes,’ said one senior US official, according to the White House pool report. “Erdoğan accepted the apology,” according to the official, the pool report said. Netanyahu also agreed in the call to pay compensation to the families of those killed in the raid on the flotilla, that had sought to deliver humanitarian aid to Gaza, Turkish media reports said. On the ship, part of a flotilla attempting to break Israel’s legal (according to the UN’s Palmer commission) blockade of Gaza, was a contingent of Turkish thugs from the Islamist IHH organization. They boarded the ship separately from the other activists, and armed themselves with pipes, metal bars, knives, etc. 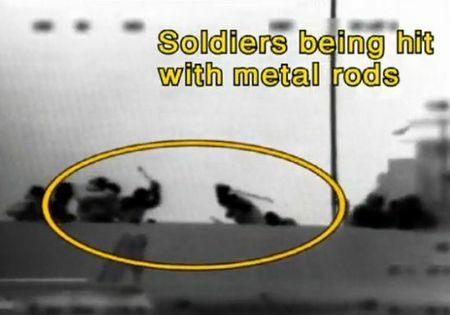 When poorly prepared Israeli commandos (again legally) landed on the deck, they were attacked, beaten and stabbed. Several were injured, at least one quite seriously. After the Turks took several injured commandos hostage, moved them below decks, took their pistols and began to shoot, the Israelis responded with live fire. Nine of the attackers, one of whom was an American citizen, were killed. Five other vessels in the flotilla were intercepted without incident. There is good reason to believe that top levels of the Turkish government planned this incident with the intention of provoking violence. The performance succeeded spectacularly, the final incident in an escalating series of dramas orchestrated by Turkish PM Erdoğan with the intention of weakening and ultimately destroying the formerly good relationship between Israel and Turkey (and especially the Turkish armed forces). US pressure following the incident caused Israel to significantly loosen the blockade, rendering it ineffective as economic warfare against Hamas, and providing a propaganda victory to Hamas supporters, including Erdoğan. Israel had already admitted that it had made mistakes in intelligence and preparation — the commandos should have expected a violent reception and should have been appropriately armed with effective non-lethal weapons (they had paintball guns and flash-bang grenades). Although Israel did not accept blame for the killings, which it considered justified self-defense, it did offer to compensate the families. This was unacceptable to the Turks. Now it appears that Mr. Obama has pressured PM Netanyahu to give up on the idea that IDF soldiers are entitled to defend themselves when they are being fired on, and see their colleagues beaten with pipes and thrown into the sea with their abdomens sliced open. I’ll add that Netanyahu has offered this apology to someone who just a few weeks ago called Zionism a crime against humanity. Can you think of any other case when a head of state apologized after such an incident? And to such a person? One of the criticisms leveled against Netanyahu from the Right has been that Bibi, who has demonstrated undeniable physical courage in battle, lacks the moral courage to stand up against this kind of pressure. Today, it seems like this is true. It will be interesting to see if this will have immediate political consequences for his leadership. My guess is that it will. Some commentators wondered what Obama’s visit was all about. After all, there were both positive and negative aspects of his public remarks, and nothing significant seemed to have changed in his position. Points with Muslims around the world, by affirming that a Jew is never justified in killing a Muslim. Points with his “outstanding partner and … outstanding friend,” Erdoğan. To humiliate his enemy, Netanyahu. He hasn’t forgotten that standing ovation from Congress. To hurt Netanyahu politically at home. To prove that an Israeli leader has to do whatever the US President tells him, no matter how wrong or degrading. To suggest that Israel has no right of self-defense. To prove, yet again, that Turkey is a more important ally than Israel. To show that Israel is not a sovereign nation, but rather a colony of the US, which can decide what its borders are, where its capital isn’t, and when it can or cannot use force.